Our Bottle and Can Openers will add professionalism to your bar or restaurant, and they also make great promotional give-aways. Each Custom Bottle Opener is imprinted (with a one-color imprint) or custom-engraved with the design and message of your choice. Choose from four different custom wood handle and metal can/bottle openers. These high-quality Can and Bottle Openers are both sturdy and stylish. Our Custom Wood Can/Bottle Openers (#2092 and #2068) and the Silver Bottle Openers (#9532) are Laser-Engraved, while the Economy Bottle/Can Opener (#6000) is screen-printed. 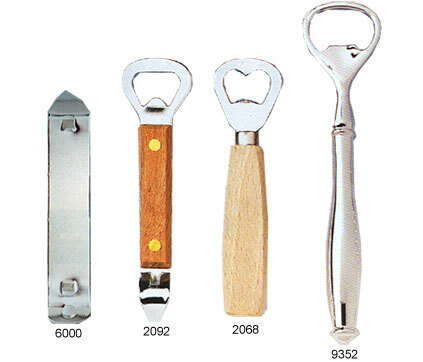 16000 Economy Bottle/Can Opener 1.05 1.04 0.95 0.94 0.85 1-7/8" x 3/8"
12092 Wood Handle Bottle/Can Opener 2.89 2.83 2.69 2.49 2.29 1¾" x ½"
12068 Beechwood Handle Bottle Opener 2.49 2.43 2.29 2.11 1.93 3" x ½"
19352 Silver Plated Bottle Opener 9.95 9.75 9.35 8.95 7.95 1" x ¾"
For additional information on Custom Bottle/Can Openers or our other Bar Supplies, please contact us at 1-800-233-0828.